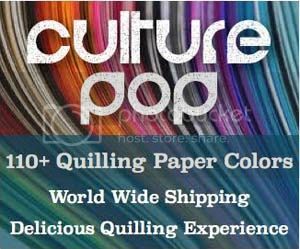 I recently mentioned that I had made an order of Culture Pop quilling paper from Little Circles on Etsy and that I was going to start making some jewelry with it. So far I have made 2 pairs of earrings, with more new designs sketched out just waiting to become realized! I started with a basic, but fun design. My goals were to use colors that blended well together, and to use the bamboo quilling forms as well. I noticed that 5 of the blue colors in light blue/aqua hues really blended well together. It is not usual to find this many shades that flow together so beautifully! I am definitely impressed by that and cant wait to order more of the Culture Pop line to see how many groups of colors like that I can find. It is fun to use contrasting colors sometimes, but it is also fun to use colors that blend seamlessly. In case you are curious, the specific colors I used for this design were, from lightest to darkest: icy pond, let’s go fly a kite, leaving on a jet plane, school break swell, and down by the bay. I chose 3 of the bamboo quilling forms in various diameters and used whole, half, and quarter strips of paper to wrap around them for the various sizes in the design. I used a lip balm container that I have to wrap the circle around and then fit all the little circles inside of it. It is not perfectly round because of the way I pushed the pieces in place, but I kind of like that. If I had wanted to make sure it stayed more perfectly round I would have made the border thicker and not placed as many pieces inside. As usual, I finished these earrings with niobium jump rings and ear wires . I use niobium because it is sturdy, non tarnish, and very hypoallergenic. Plus it can be anodized in many different fun colors! I know it can be hard to buy sets of hooks with the corresponding jump rings so I sometimes sell sets here in my Zibbet shop for convenience. You can also find them in online shops that sell jewelry supplies, but the ear wires are almost always sold separately from the jump rings. I didn’t make a tutorial for these earrings as I was mostly just having fun, and they are a pretty random design. But if you have objects of different diameters and several different shades of paper, you can make something similar! Of course you will want to use some sealant, top coat, or varnish of some sort on your earrings to make them water resistant and sturdy. With these I used Ceramcoat All Purpose Sealer as the basecoat. I used it to thoroughly wet the piece, then dabbed the excess off with a facial tissue and laid it to dry on a plastic surface. The reason I usually use a sealer before using some sort of top coat is because it really soaks into the paper, making it stiff once it is dry. The sturdier the better I think! The sealer, though a bit water resistant, is not enough of a protective coat by itself. Once it was fully dry I used Diamond Glaze for a final glossy, hard, and water resistant finish. Click here to view more posts that are specifically about using sealants and topcoats. I have these earrings for sale in my Zibbet shop. I can make a similar design in any colors scheme as well. Stay tuned for some new quilled jewelry designs coming up, as well as new tutorials! *All products and supplies mentioned in this post I purchased on my own. 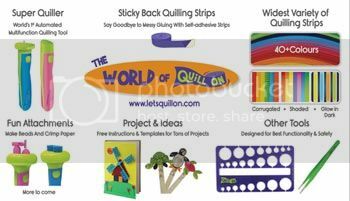 Thanks for talking about the Pop Culture quilting paper available at LittleCircles. Made my first order. The colors and quality is exceptional. They are so pretty Honey. Ive had a look at Pop Culture and next order will be to them. Very reasonabel postage too!. Yes, I liked the flat shipping!